Starting with the hack of Associated Press's twitter handle which ultimately led to a momentary crash in NASDAQ, to all new Linkedin Contacts, Facebook buying Parse, Pinterest on Nook tablets are some of the top happenings from best of social media world this week. Among them, these 8 (as below) have caught my attention as a social media strategist and so putting them up as best social media stories I read/heard/learnt this week. 1. The AP twitter account hack, indeed is the biggest news this week that sent WallStreet panic on that false news of two explosions inside white house. Guardian reported as "Wall Street collided with social media on Tuesday, when a false tweet from a trusted news organization sent the US stock market into freefall." 2. Linkedin launches all new Linkedin Contacts. Eliza Kern in her post in GigaOm expresses LinkedIn is launching a standalone Contacts app that will roll out slowly to users in the U.S. But do you really need a second LinkedIn app with only limited professional contacts in it? 3. Politics and Social Media is the hottest topic across the entire globe. Whereas India is debating on the sticky point "whether social media will influence the upcoming general elections or not", Pew research shows up with a kinda unbelievable report that all politics isn't just social at all. Jon Gold, in his post in NetworkWorld notices "Social media has yet to show its supposed promise as a great leveler of American democracy, according to a new study from the Pew Research Center’s Internet and American Life Project, which found that sharp divisions in political participation among socioeconomic groups persist despite the presence of Facebook and Twitter." 4. Twitter is testing a two factor/step authentication to put a curb on hacking. 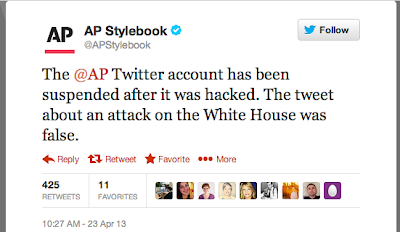 And it is actually a step taken late after that AP twitter hack. Mat Honan in his post in Wired notes as "Two-step (also known as two-factor or multifactor) authentication can prevent a hacker from gaining access to an account far more effectively than a password alone. When logging in from a new location, it requires users to enter a password and a randomly generated code sent to a device, typically via a text message or smartphone application. In other words, accessing an account requires having two things: something you know (the password) and something you have (a previously registered device)." 5. Interestingly, most of the social media users in UK belong to the age group of 55-64. Gary Flood, in his post in InformationWeek writes "The biggest adopters of social media in the U.K. aren't teens -- the usual suspects -- but their middle- aged parents. But late Baby Boomer converts might need to know that obtaining a digital identity is not a panacea, especially when it comes to employment." 6. Facebook LIKEs are worth $174 to a brand. That's what Kristin Burnham says in her post in CIO.com. "When a Facebook user likes your brand page, that click is worth $174.17 to your brand—a 28 percent increase since 2010, according to a new report. For its study, "The Value of a Facebook Fan in 2013: Revisiting Consumer Brand Currency in Social Media," social intelligence company Syncapse surveyed more than 2,000 Facebook users who have liked a brand. The research took into account factors such as product spending, loyalty, propensity to recommend, media value, acquisition cost and brand affinity to determine the value of a Facebook fan." 7. Nissan with its new campaign "Impress with Sentra" tries to build an awareness of the vehicle among customer. Emma Hutchings of PFSK noted that "Nissan’s latest campaign, ‘Impress With Sentra,’ is an interactive Facebook experience where fans can create and share a personalized video featuring the actor Omar Epps. To help them make a powerful first impression, they will be provided with a glowing introduction. Inspired by the 2013 Nissan Sentra, the company developed the campaign to build awareness of the vehicle among potential customers. Facebook users can have Epps talk them up as an adrenaline junkie, an incurable romantic or a business dynamo in a customized, shareable video." 8. Social Networks don't understand original content, that's what Austin Powell says in his post in PaidContent. According to him, "The trend among social networks to produce original content often ends badly, as Tumblr’s shuttering of Storyboard showed. Here’s where other big services, from Facebook to YouTube, are going wrong – or, in the case of LinkedIn, going right." So, these 8 are the top things or say best social media stories for this week to my eyes. Have I missed something? Please use the commenting section below to add the story you read.